Well, this is as shocking as it looks. The Howard League for Penal Reform has famously been campaigning for the improvement of criminal justice policy in the UK for over 140 years. The author of the shocking letter – Ian Blakeman – was appointed head of the National Offender Management Service by the Cameron/Clegg government because of his enthusiastic support for the coalition’s policy of privatising prisons. 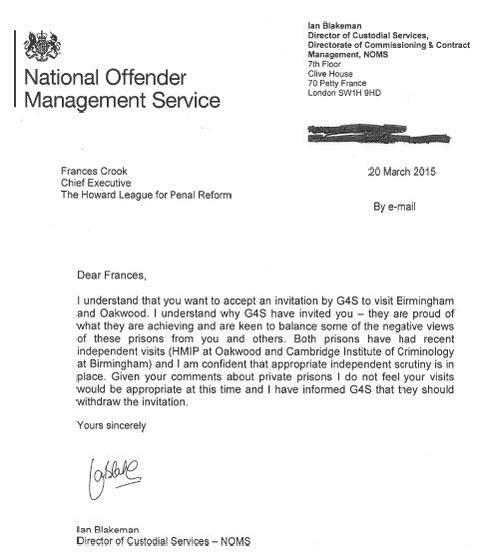 And Blakeman makes it clear in his letter to Francis Crook – the CEO of the Howard League – that it is her criticisms of privatised prisons which is the reason for the ban. So the question is – is the Cameron government doing this because it’s hoping to keep privatisation off the agenda and out of the news in the run up to the election, knowing how unpopular the policy is with voters? If so, we’d better make sure we keep it in the news. This is another example of Cameron’s government refusing access to its critics, because it fears public outcry at the results. Johnny Void has blogged about the way the DWP has similarly refused to release the names of the firms participating in the workfare programme. There government blatantly admits that it will not do so, because public pressure will force those companies to withdraw and the scheme collapse. It’s clear they fear exactly the same here, and have the same lack of shame in almost admitting it outright. Bobchewie in his comment mentions the US, where private prisons and the judges in their pay get paid according to how many prisoners they have. This is exactly right. It’s covered in Michael Moore’s documentary, ‘Capitalism: A Love Story’. That includes the cases of troubled teenagers, who were guilty only of minor offences, if that, who were sent to adult prisons. Why? The judge overseeing their case was on the payroll of the local private prison corporation. That’s the real, grim face of the private, for-profit prison system, brought to the UK by Cameron. ….likewise the same “logic” that is used to justify the existence of private prisons could also be used for the minimization of the armed forces with the likes of Blackwater contracted to fight bargain wars. MPs who voted on the amendment of official secrets act. The whole thing is a joke that I don’t find very funny at all. Attempting to abdicate responsibility, whilst at the same time preventing proper oversight and accountability of the Privatised “services” is the standard operating procedure of this “Government”. If they are not removed from office this May, that will be the end of Britain as a civilised country, for a while. It may well result in extreme violence, the like of which this country has never seen – make the civil war look like a re-enactment version of itself. I can’t see it ending well and for most of us with children, it is a chilling prospect.